I like looking at how other games do things. This is true for board games, computer games, RPGs; it’s great to see other ideas that people come up with. So, while I don’t play Rift, I was interested to see this dev PvP-focused post on the Rift community blog that Rilgon tweeted a few nights ago. I don’t play Rift, so I apologize if I get the nuances of this wrong, but they’re making a few interesting changes. PvP damage reduction (Valor) is being standardized across gear sets and tiers. Gear sets will be differentiated by their main stats instead. Attack and Spell Power on select PvP items will be divided into Vengeance – a PvP only stat – and regular offensive power, making these items far less appealing for PvE (but desirable in PvP). Hey, those are some pretty cool ideas! There are several big challenges regarding damage reduction when progressing through endgame PvP during an expansion. Resilience levels become unevenly distributed through the PvP playerbase as characters reach different gear levels at different times. Resilience levels increase with each new tier of gear. This increase somewhat offsets the increase in main statistics and overall firepower, but unevenly. Offensive power, health pools, and some resources (like Mana) differentiate gear sets. Once you have a basic PvP set, you might not be as effective as people with better PvP gear, but at least you have the standard Resilience level. The downside of this kind of model is that it causes PvP to speed up as gear improves over time. So at the beginning of the expansion, let’s say you have 6,000 Spellpower, midway through, you have 8,000, and at the end, you have 11,000. (This is a hugely simplified model.) Spells are hitting for 83% more damage – and if there is constant damage reduction, then PvP damage increases at the same rate. The only ways around this is to make abilities scale non-linearly with Spellpower/AP etc., to increase health pools at the same rate, or to accept that PvP will get faster during a given level cap. It’s not actually a bad thing to mix and match responses here – health pools will get bigger, so that slows down the increase a bit, but yeah, the first season will feel a little slow, while the last season feels a little bursty. So I think it’s kind of a mixed draw at the endgame, to be honest. I think standard damage reduction on PvP gear would make PvP more accessible, but not necessarily easier to balance over time. The key here, though, is making Resilience a neutral stat on items, because right now it isn’t – it’s a key component of the item budget, which means that if an item is marked for PvP use in WoW, it gets less potent in PvE (and PvP). You make tradeoffs, and when stats scale as well as they do at low levels, those tradeoffs are important. There’s a balance challenge here, between bringing better PvP scaling into the leveling game (which could be accomplished simply by introducing Resilience gear at low levels), making PvP more accessible to new players (especially at endgame), making it less grindy and possibly easier to balance – with the potential for really disrupting endgame PvP by making combat increasingly faster, of making people feel like they’re actually getting weaker over time. I don’t know if I’m for or against standardized damage reduction in WoW, to be honest. It’s not as cut and dry as it seems. Vengeance is another really interesting idea. What if a component of damage could be made to be only affect players? You then have a way to make PvE and PvP gear functionally different and remove the desirability of PvP gear in PvE. That’s a good thing. If you have two equivalent pieces of gear, and the one you get through PvP does half the damage in PvE as the other, then it’s not going to be an appealing piece of gear for anything but PvP. The challenge I see here with WoW is that while there’s a real problem of bringing PvP gear into PvE (tanks, I’m looking at you! ), there’s an equally bad problem of PvE gear disrupting PvP, especially in the latter stages of an expansion. PvPers bring heroic raid gear because it’s the best gear they can get. Taking some of the damage out and making it player-only doesn’t help with this – since that damage is all PvP damage. This leads to an interesting thought exercise – how could you make PvP gear in WoW work so that it was not appealing to PvE, but more appealing to PvP than the best PvP gear you could get? You make it better than the PvE gear, but assign half its damage to a player-damage only stat. You’d have to flip the current model, where PvP Conquest gear lags behind PvE Heroic raid gear by half a tier, and instead move the PvP gear up – while degrading it’s PvE utility considerably. That would be a pretty substantial change. The effects of this change on other parts of the game would be felt pretty quickly. Let’s say PvP gear jumps up a tier. Relatively speaking, within PvP it’s balanced, but now you’re closer to that bursty end-of-expac state where damage is high and mitigation is low. What about players who supplement their gear with PvP gear in certain places? I’m not talking about the tank in full Conquest gear, I’m talking about the healer who picks up a set of bracers and a nice weapon and uses them in both PvP and PvE. Those pieces become useless in PvE, which makes gearing up for raids a bit harder. Not a lot, just a little. Instead of applying to gear, this might make more sense to apply player-only damage to abilities. This would change the dynamic of abilities to allow them to be buffed/nerfed separately in PvE and PvP. And while it usually would mean that PvP damage would always seem to be higher than PvE damage, the assumed standard damage reduction would help bring it back in line. If an ability does X damage in PvE, and X+10% in PvP, if there’s a standard reduction of 30% the PvP damage remains lower than PvE. But that involves a pretty radical restructuring of abilities. I think Rift’s Vengeance is an interesting idea, especially coupled with the standard damage reduction of PvP gear. But you have to really structure everything around it. It solves one problem brilliantly – PvP gear going into PvE. It would make a great solution to PvP weapons, allowing them to be immediately available but not desirable for PvE. This would allow the gating mechanism – which serves to drive PvPers into PvE – to be phased out. But it doesn’t seem to really address some of the big issues, like having an ability be overpowering in PvP, but the nerf seriously impacting a PvE function. Vengeance is another way of expressing having the same ability do the different things in PvP and PvE, only it applies universally to all the character’s activities. That’s pretty neat. It’s also a way to make PvP gear unappealing to PvE players, which could solve the clunky gating on weapons. Perhaps weapons, trinkets and bracers would be the best place for a Vengeance-like mechanism in WoW, since those are the items most commonly sought after by PvEers. The issues with PvP/PvE balance in Warcraft are complicated. As a core game mechanic, I think this is pretty cool – but it’s not a core mechanic of WoW, yet, and while it solves one problem neatly, it exacerbates others. Still, I find it really interesting to consider the possibilities. It probably bears saying that I don’t play Rift, and as such, I have no idea how this is going to affect Rift PvP. My commentary (both enthusiastic and skeptical) is solely directed towards Warcraft, and shouldn’t be taken as a commentary about Valor and Vengeance in Rift PvP. I leave that to the Rift PvP bloggers! My gut tells me that if you make these kinds of decisions early on, and make them the core of your PvP game, then they’ll work just fine. So I hope Rift PvPers will let me know how it all works out! I do like that at least someone out there in the gaming industry is making an honest effort to make such a distinction between the PvE and PvP settings. I don’t think that it would have much of an impact on balance in WoW if implemented in exactly the same way. The real problem, as you touched on a bit there at the end, is really the player abilities. As far as balance goes, that’s really where the biggest problem is and applying the concept of Valor and Vengeance there would have the most impact. Putting the stats on gear is a good thing, but it should really be the spells that are impacted by those stat values instead of the items themselves. I completely agree with you on the point of adding in damage reduction pieces across the board for leveling. If WoW were to implement this type of system, and included low level gear in the mix as well, I think we would see a huge impact on low-mid level PvP. I’d love to no longer have to run away from Hunters on my low level toons, or constantly feel that itch between my shoulder blades when I know there’s a Rogue sneaking up to one shot me. I’d love to be able to have a full set of PvP gear for various levels. With the new x4/x9 system I don’t think it would be necessary to have full sets for every bracket cap, but maybe half the gear requires x4 and the other x9, or even just the x9’s. I think even without standardizing damage reduction, having coherent PvP sets available at every x8 or x0 or xN level would be a great improvement to low and mid-level PvP. While it might make some people say “this is OP, it makes X class unkillable,” I agree – it will make for longer, more meaningful fights. Playing in the 70 bracket means Resilience, and Resilience means I can actually survive for a little bit. Personally, I’ld like to see them put together a 5 piece set of “heirloom” style gear with PvP stats. Make it BoP and purchased cheaply at lvl 10. Use the old battleground vendors (WSG, AB, AV) to sell blue gear for the other slots on the x9s. You get a nice 5 piece set the grows with you and the need to fill in the other slots with gear that doesn’t grow should let some honor bleed out of the system so players don’t reach the endgame with full honor and justice. Along the lines of Kierbuu’s reply: I agree. I would love to see a full set of PvP heirlooms instead of just the shoulders. Assuming they actually had resilience or whatever other form of PvP stats Blizzard might use in the future, they could easily solve this particular problem. I think the biggest question left unanswered by your post is what to do about healers. When I PvP, I do so on a Holy Paladin – and yes, I do actually use both a S9 weapon and bracers in my PvE set due to the lack of available choices in PvE. (I’m in a social guild that raids casually so I had the choice of PvP bracers or pugging Heroic Grim Batol every day for a shot at some blue ones. For offensive casters, your suggested changes would work to make the gear less viable for PvE but for someone like me, who does both PvP and PvE casually and only uses my ret spec for questing, I’d be able to carry my PvP gear anywhere I wanted without a penalty. Do you foresee that as being an issue or do you think that if you’re only talking about healers it wouldn’t matter unless/until you had PvP geared healers trying to heal in the as-yet-undisclosed Random Raid Finder? You’re right, Vengeance doesn’t apply to healers – and you can’t really apply a flat increase/decrease when healing a player – unless you also linked that to being into a pvp arena (or being pvp flagged) – but I think that would get clumsy and confusing as well. Assuming they have one gear set and the options aren’t available to switch out for more haste (most of the choices are between crit and spirit on the current gear) – the lack of haste would put you at a disadvantage for PvE – you just wouldn’t have the same throughput . The disadvantage is not likely to be to the extent that you’d see going into a PvE environment with a PvP weapon under this model though. But another great article Cyn, thank you! @dewd: It’s a really good point about healers. I hadn’t thought much about how Vengeance would work there, but logically it doesn’t affect them at all (except, perhaps on a Dreamwalker-style fight) unless (like Gameldar says) you link it to PvP-flagging, but then you just raid with your PvP flag on and the whole simplicity of the idea goes away. My personal opinion is that healing is a tough enough job, go ahead and let healers be able to use Vengeance gear. Selfishly, if it drives more healers into PvP for good gear, then PvP improves. But I imagine a lot of healer players wouldn’t like that, so it’s got to be flagged as a potential problem. One of the big problems that drives time-constrained players to use PvP gear in PvE is guaranteed availability. Bracers are a great example – they never seem to drop, there aren’t enough of them in PvE, so many people just get the PvP ones as a stopgap. If Vengeance creates too big of a divide between the areas of the game, that slot is going to be really hard to fill. Trinkets and Weapons are the other two slots I know need more drops. @gameldar: Thanks! I think the problem with healing gear is going to be the sheer awesomeness of having bonus Intellect on gear, not the secondary stats. Intellect (and spellpower) trumps most everything these days. But you make a good point about the secondary stats, perhaps that’s where this could be applied. Vengeance as Haste (or perhaps making things instant?) could be an interesting mechanic! Penetration already exists for spells, but what if we changed it up a bit and made it work for melee as well (like hit, crit, and haste do now). Make penetration the enemy of resilience. Kind of like armor penetration, penetration rating could be a percentage of resilience ignored. Any damage dealer in PvP would want some penetration rating to cut through resilience on other players. To keep things from getting to out of hand, however, resilience would need to do a much better job at stopping damage. If the value of resilience was roughly doubled those PvE weapons at least might become much less valuable. Everybody is going to need resilience to stay alive. Every damage dealer is going to need penetration to kill much of anything. Correct me if I’m wrong but are you suggesting making resilience more powerful and then adding “resil”-pen to PvP gear to ensure that PvP gear is shifted away from PvE use? I think it’s an interesting concept and, if you combine it with your other suggestion of having a baseline 5-piece PvP set that grows with you, it could work. Ideally, they would give you access to a base 5-piece set and then it would grow like heirlooms and also give you the option to upgrade it with honor – so you can trade in, say, the base item for one with a socket, or the 1-socket chest for a 2-socket chest. If you make the base set have a decent amount of of resilience and purchasable with either honor or justice it would help get folks over the initial catch-22 of not having enough resilience to do well enough in PvP to get enough honor to buy enough resilience gear. Yep, I think that is where my train of thought is going. Making resilience stronger and adding some kind of penetration to the PvP game would hopefully have two effects. Make PvP gear less desirable in PvE because it would have even fewer useful secondary stats while at the same time using PvE weapons would make you both weaker and more vulnerable in PvP content. I wasn’t thinking so much of upgrading the heirloom set. More along the lines that anybody could pick up a piece or two while leveling to make battlegrounds a bit easier. You could wear the 5-piece from 10-85, upgrading it for crafted or vendor pieces when you reach endgame. The other pieces (boots, trinkets, weapons, etc.) would not grow with you and would need to be replaced every few levels as a way to bleed off honor if you leveled thru the PvP system. Hadn’t really thought about sockets, but from what I understand the current stance from Blizzard is that sockets are only for endgame gear as most players don’t want to socket items until then anyways. I like the idea of having damage reduction be PvP gear neutral, because there wouldn’t need to be drastic changes to PvP gear that’s available for less than L60. As it is, the <L60 PvP gear would need to be adjusted to include Resilience, and given how OP certain classes are at different levels in the game (/cough Rogues-and-Hunters /cough) that could smooth out the burstiness of those classes in low level PvP. That said, Blizz tends to balance for end game, not the low-mid levels, so I have no idea how this would unbalance the end game. To remove PVE weapons from PVP I guess spell penetration (only on weapon) could be the solution. No weapon spell penetration = no hit. And that should go for casters and melee alike. And PVP weapons that only have resiliance and spell penetration as “green” stats, will never be solution in PVE. Another solution is to add “PVP Gear bonus”. Each PVP gear would give you a “PVP Gear bonus”. As you have 17 slots for gear you can max get 17 PVP points. 17 pvp points would make your gear work 100%. For each point less you get the reduction 5,89 % (100/17). Thats a rather heavy loss. And when you miss 3-4 pcs that is 15-20% less stamina, strenght/agility/intellect, resiliance and whatever. Your gear will off course only get the bonus from pvp points when you hit another player. If you hit a PVE boss your gear wount work at all…. Been walking the dog and was thinking some more on this subject. 17 slots awards 17 points, but weapon slots award double. Thereby we get 20 points equals a 5% for each “pvp gear point”. In PVP any missing “pvp gear point” will reduce your stats by that amount of percent. In PVE any “pvp gear point” will reduce your stats same way. So a dps/tank in pve content with 5 “pvp gear points” will lose on all stats with 25%. That will hurt a lot and problem will be solved. The other good part with this solution is that the gear professions will get more business. I’m also speaking from a place of ignorance here, as I didn’t PvP prior to resilience, but I’ve heard calls for going back to not having any “pvp” gear at all, in that all gear is obtainable in a similar fashion without distinction between PvP and PvE. You could just have one currency per tier that bought all the gear. There’d be no special stats for PvP only. Any thoughts from your experience? The major problem of that proposal is that it ignores the cultivated difference between damage scales in PvE and PvP. Boss encounters are designed to last 10 minutes or more for progression content, so the players need to be able to do millions of damage over that period of time. DPS needs to do sustained throughput of 15-30k DPS, with the ability to blow cooldowns and do more, or to hit execute phases with huge amounts of damage. Players simply can’t have enough health to compete with that scale. If average gear is giving people about 120k health, and average sustained DPS is 20k, then, without healers, the targeted player has 2-3 GCDs to react and stop the opposing player before they are dead. Complicating the issue are factors like burst with CDs, execute abilities, and focus fire from multiple sources. When burst gets too high, you get globaled – a pvp term for getting killed in a single GCD, with no chance to react – and it’s not good for the game. Longer fights are honestly better. Example: I have practiced a lot with a Destruction Warlock technique called Seduce Nuking. You hold a target in place with your Succubus and then you layer nukes on to them so that they hit in an extremely short period of time. Chaos Bolt, Shadowfury, Immolate, and Conflagrate – all heavy hitters on their own right – can be timed to hit all within a single second of time. In the next three seconds you can get off two Incinerates or a SF/Incinerate combo – while timing those to land just before your Succubus re-Seduces the target. It’s hugely devastating. A further problem is that the current spilt means that PvP gear offers more effective health against other players, but it also reduces damage output. Moving to a single tier of gear would actually increase damage to keep it on par with PvE damage requirements. So the damage we currently see in PvP would be increased above and beyond current levels, while survivability goes down. An interesting place to watch this in effect is in the level 65-69 PvP bracket. Damage is pretty high there, especially at the top end of the bracket as Northrend greens come into play. But at level 70, BAM, Resilience gear hits, and fights lengthen out again. So, in general, I’m not in favor of this kind of proposal, but mostly because it goes the wrong way – higher damage in PvP, shorter fights – in the name of simplifying gear. The gear issues WoW has introduced over the years are pretty complicated; I’d rather see people be able to get the same set of PvP gear cheap, but have it be less good than the craftable PvE gear. Flip side? No PvE gear in PvP, period. My objection to my own idea is that doing so would take a lot of the joys of gearing out of PvP… but it also takes the hassles, too. It’s a tough thing to solve. There’s a lot here I hadn’t considered, and you certainly make clear why we can’t just drop the difference. However (isn’t there always a however), I wonder if – and this is the first time I’ve ever wondered this, to be honest, I’ve always felt the opposite way – the PvP game is being hurt by the PvE game. WoW certainly took this to new levels if you consider a well-geared tank at level 60 in vanilla had about 4k hit points and 25 levels later – less than 150% of the levels, to be clear – they have about 2500% of the hit points. Bosses, thus, have to scale to stupidly high levels of hit points. Realistically, there’s no difference between Rags having 246 million hit points and dps doing 30,000 dps (ugh redundancy) and Rags having 24,600 hit point and dps doing 3 dps. Mathematically they’re equivalent, but the players ego isn’t as epeened, so power drifts higher and higher. If this weren’t the case, we could easily sustain a single set of gear. 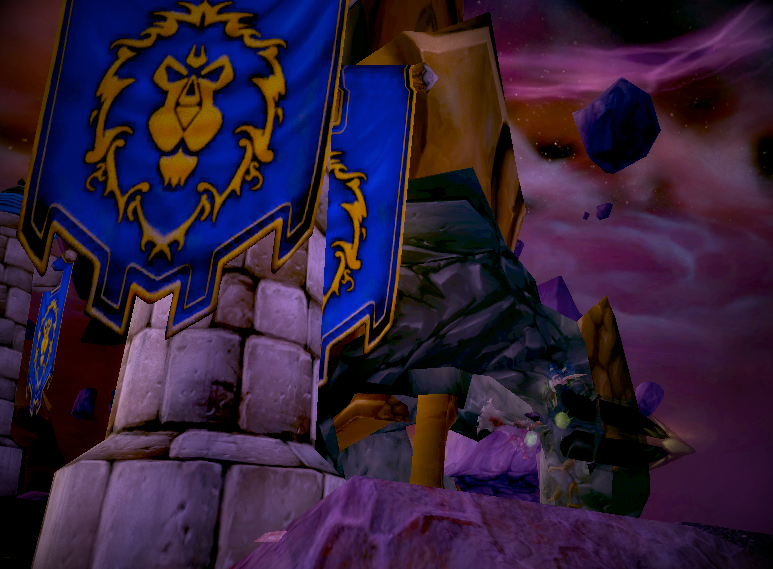 For the record, though, I feel a lot of the leveling bgs I’ve done – not representative at all of endgame, I fully admit, but still – have been exactly as you describe “bad” pvp to be. I’m usually either dead within a few GCDs or the other guy is; this is speaking from my rogue’s PoV. From my priest, battles may go on (I’m Disc), but only because I do so little dps to them, but they can’t adequately kill me, either. Focused fire situations only make that worse. My experience with end-game PvP is so limited – one season of arenas and a few RBGs, that I can’t really form a fair opinion there, but I wonder how much it would affect the game to drop all the old tiers of PvP crap and only have level 85 players worry about it. It certainly would take the intellectual pain of wondering what set to use away. Great post, again, and thanks for the response. That’s an excellent way to put it. If there was no PvE-induced power drift, PvP would be much better off. It’s one of many reasons I enjoy twinking – it negates the stat inflation present in the endgame.